Patrolmen's Benevolent Association President Pat Lynch said the union is going to binding arbitration after being unable to reach a contract deal with the de Blasio administration. NEW YORK — The head of the NYPD police officers' union blasted Mayor Bill de Blasio's offer of zero percent retroactive raises for three years — even as the city agreed to give the teachers' union a four percent retroactive raise and a raise going forward. 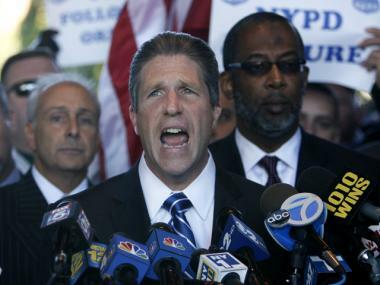 Patrolmen’s Benevolent Association President Patrick Lynch said Thursday that his union was granted a declaration of impasse by the state's chief mediator on Thursday after union officials couldn't reach a satisfying deal from the city. According to sources, de Blasio and his team sat down with the PBA, whose officials have been working without a contract since 2010, and offered them a contract to cover three of those four years. But the city offered zero percent raises for all of the years covered by the contract, sources said. "Our officers are already among the lowest paid big-city police officers in the country. Now the city wants us to take another three years with no raise and that is simply unacceptable," Lynch said in a statement. "We look forward to participating in good faith in non-binding mediation in the hopes of achieving an agreement." Under the terms of Thursday's decision by the state’s Public Employment Relations Board (PERB), which mediates contract disputes between the city and unions, a mediator will be appointed by PERB to help both sides reach a deal, Lynch said. The PBA also worked with PERB for three of its last four contracts under binding arbitration, including its most recent contract with former Mayor Michael Bloomberg, Lynch said. De Blasio's team did not immediately respond to calls for comment. But in the agreement with the teacher's union, de Blasio's team is asking for healthcare cost savings they say will save the city $3.4 billion — but only if all municipal unions, including the PBA, sign on.